Best thermal performance for applications with Rth: 5 – 8 °C/kW. Aluminum can be joined with Friction Stir Welding or Vacuum brazing. Designed to meet the ighest thermal requirements with density > 20 W/cm2. Complex geometry of each PIN creates turbulence with low flow rate values, resulting in a very high thermal performances vs. pressure drop. Suitable for high end applications, like power converters for wind mills, traction converters and many more. RB cold plates can be assembled using Friction Stir Welding using EN-AW6000-series aluminum alloy and die casting alloys or Vacuum Brazing using EN-AW6000-series and EN-AW3003 as core material and EN-AW4004 or ENAW4104 as cladding material. 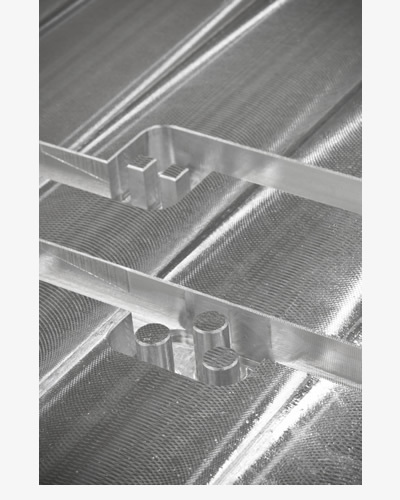 FF cold plates use some of the most mature technologies available today that are folded fins and vacuum brazing, well known from many industries like power train application. 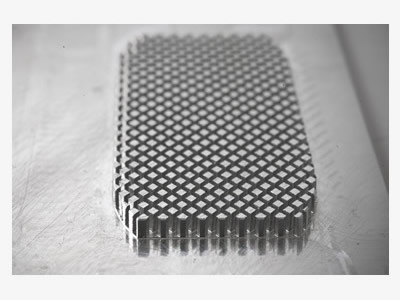 The fins are manufactured using a stamping process, making them cost effective and suitable for high volume production. The fins generates turbulence inside the water channel, increasing the heat transfer thanks to improved convection. The vacuum brazing process is used to join together the fins to the baseplate in order to increase the strength and to improve also the conduction effect. FF cold plates are using vacuum brazing process using EN-AW6000-series and EN-AW3003 as core material and EN-AW4004 or ENAW4104 as cladding material. All aluminum construction available with Friction Stir Welding process (FSW) or Vacuum brazing process (VB). 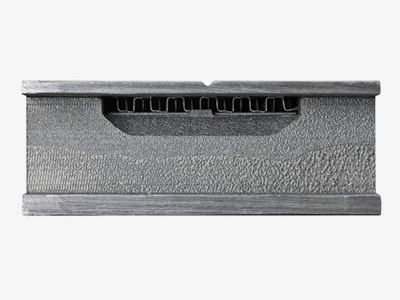 MC cold plates use milled channels positioned below the heat load to remove the heat. MC cold plates are used in industrial and medical applications where it’s necessary to move from air to liquid cooling and the design needs the maximum flexibility. Thanks to the strength and speed of the FSW process, these cold plates are today the most cost effective solution to cool components with a good compromise in thermal performaces vs pressure drop ratio. MC cold plates can be assembled using Friction Stir Welding using EN-AW6000-series aluminum alloy and die casting alloys or Vacuum Brazing using EN-AW6000-series and EN-AW3003 as core material and EN-AW4004 or ENAW4104 as cladding material. Very similar to the MC series concept, this kind of colplate use the deep drilling technology as the way to create internal channels. Can be used as alternative in case of big coldplates where performances are not so strict and the freedom in terms of layour is very high. Channel diameter from 2.00 to 24.00 mm. 800 mm for a blind hole. 1600 mm for a through all hole.